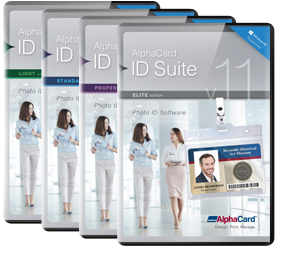 AlphaCard ID Suite goes beyond basic ID card design & printing. Use this guide to select the right edition. The single-license editions may only be installed on one computer. To move the license between multiple computers, request the Secure USB Key add‑on. This is only available with the Standard, Professional, and Elite editions. These enterprise editions are perfect for large organizations. They are installed on a network server & accessed by up to 5 users simultaneously. The software functionality is the same as the single-license editions. The Print Server streamlines printing by managing up to 5 ID card printers. This add-on is only available with the Business Server editions. The Print Server Manager extends the functionality of Print Server to streamline printing with up to 25 ID card printers, and includes load balancing functionality. This add-on is only available with the Business Server editions, and requires Print Server.